You are browsing the archive for Sharp Practice. Sharp Practice – Putain’s Patrol. Putain is sent on a dangerous mission by Colonel Goransty to scout the land to the west of El Hamid seeking out the Turk and tracking down Padre Borganski who had gone missing and with him the ancient relic of St Peter. The scenario was generated using Platoon Forward – The Patrol Scenario. I had to be honest when the dice rolled I was encouraged by the table layout, Borganski was hidden in the centre of the table with a reasonable amount of terrain around the table. The Russian’s were to enter the table and pass through all nine sectors hunting down the padre, the Ottoman’s were to appear in one of two places, only one would be real. Padre Borganski lies injured in the shade of an olive tree, his ankle broken. The Ottoman’s are revealed and some great rolls mean’s that the Ottoman’s are all musket armed, surely a chance to deal a blow to the Russian Invaders. 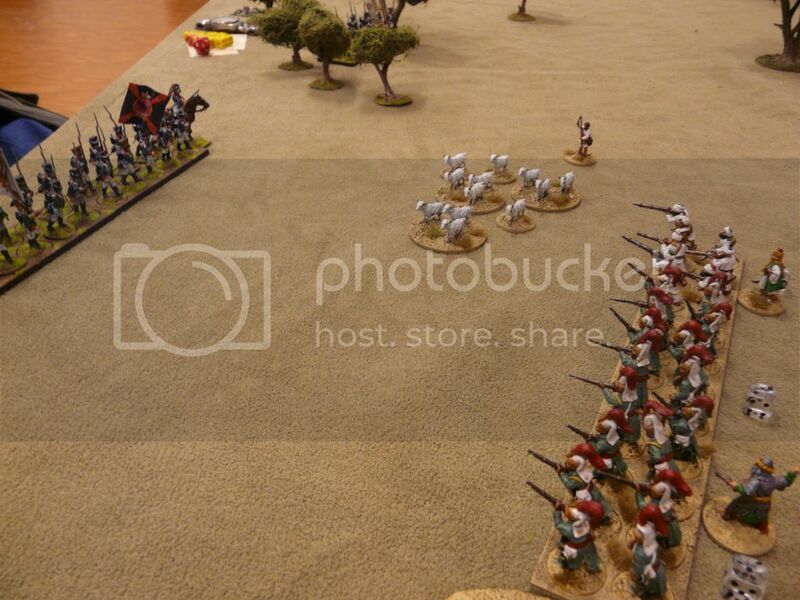 The Janissaries are newly painted which is a little worrying… The curse of freshly painted figures. 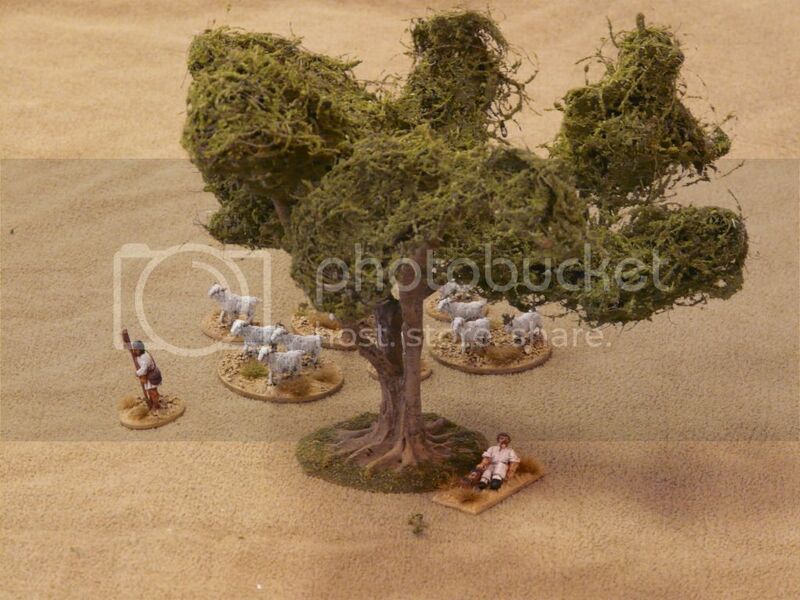 The Russian’s release the first volley inflicting shock on the Turkish line, as the Ottoman big man card comes up, a movement event forces a goat herd to break free from their herder and head towards the Turkish lines. I can’t stand stand up to the Russian volley’s and seek shelter of the Ottoman hovel. The Russian’s secure the Padre and push the Ottoman’s back further, another victory for Kaptain Putain…..
A sunny afternoon in Spain, a rainy weekend in the UK. A number of cancellations this weekend had let us without a game for Sunday evening. 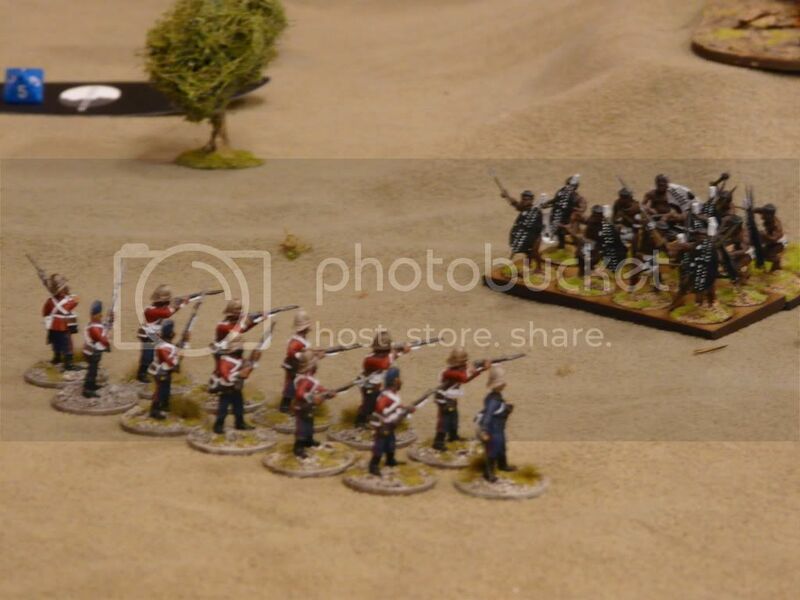 A lack of Napoleonic miniatures had kept us from the original Sharp Practice although we play plenty of TSS, the ACW variant and our own Zulu variant. We found we could scrape together about eight groups plus big men so thought we would give it a go, if nothing else it might motivate us to paint so more! Dodgy photos are courtesy of my phone, hence the poor colour balance. Figures are Victrix, Foundry and Front Rank. Buildings are from Snapdragon, Italeri and Grand Manner. Rules are of course Sharp Practice by Too Fat Lardies. The table saw the church at one end of the table with a few more buildings on the flank, a sail-less windmill dominated a small ridge. A small wooded hill dominated the other flank. 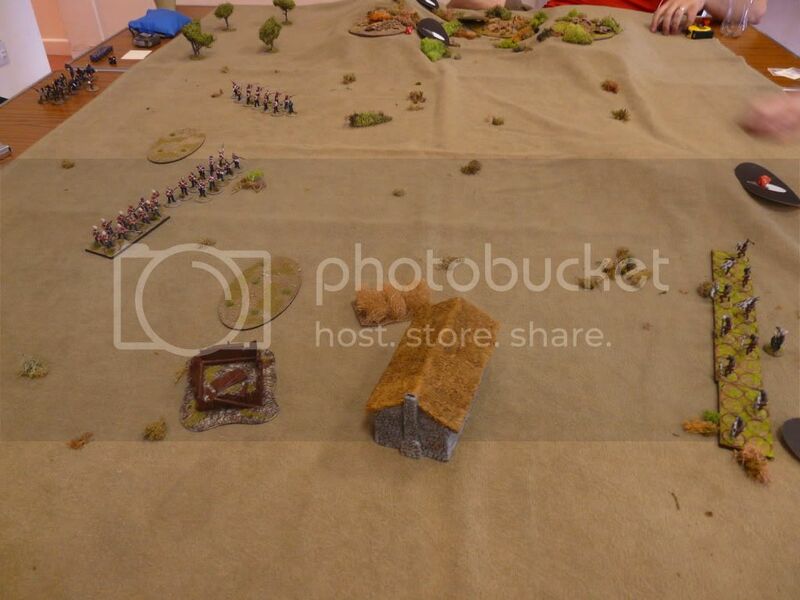 All the forces started the game on blinds, the French moved a blind down each of the tracks whilst their third blind took a position behind the ridge. The British advanced two groups centrally in to the centre of the village, the third group moved through the wooded hill. The second turn brought the French off their blinds, revealing the left most blind as empty. They then used their actions to spot the British. The blinds in the village centre revealed three groups of foot whilst the group on the right were revealed as riflemen. 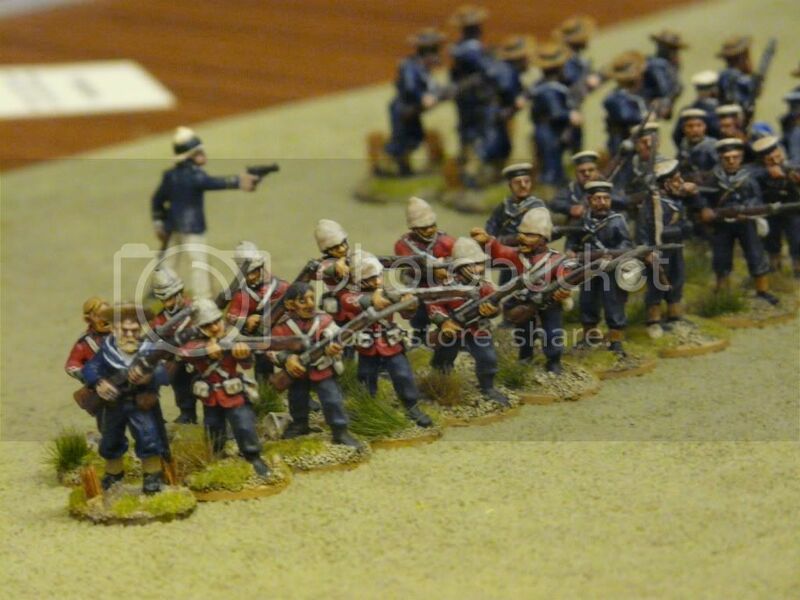 French skirmishers supporting a group of French line. The feared British riflemen took aim on their prey, their officer called forward the chosen man to thin out the French officers, alas he has used his supply of finely milled powder to provide them with yesterdays rabbit supper. The British line form themselves in to a formidable three group formation, the French groups form in to a formation behind the ridge. 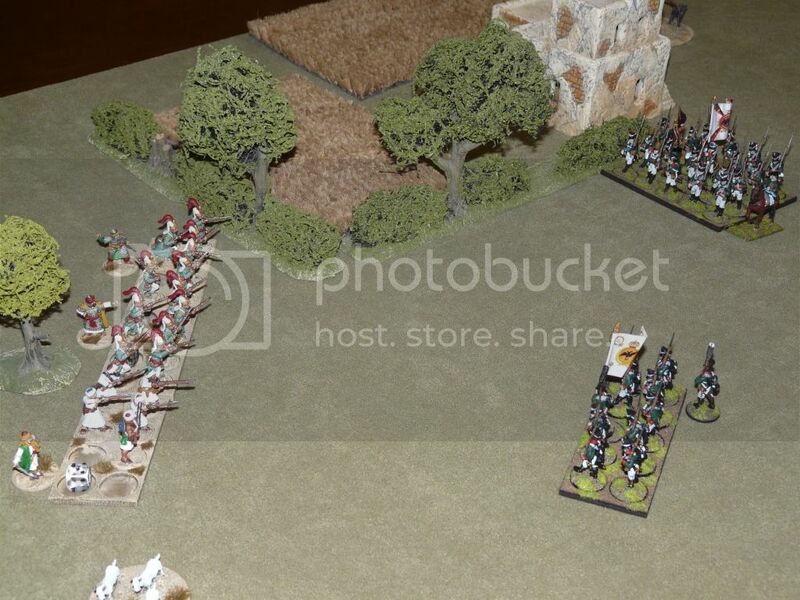 In order to cover their flank the British commander orders the end group to wheel against the French to protect the flank of the others, after losing a man insensible to drink, they open fire on the French to their front. The longer range of the riflemen is having a telling effect on the flank doing useful work against their opposite numbers. 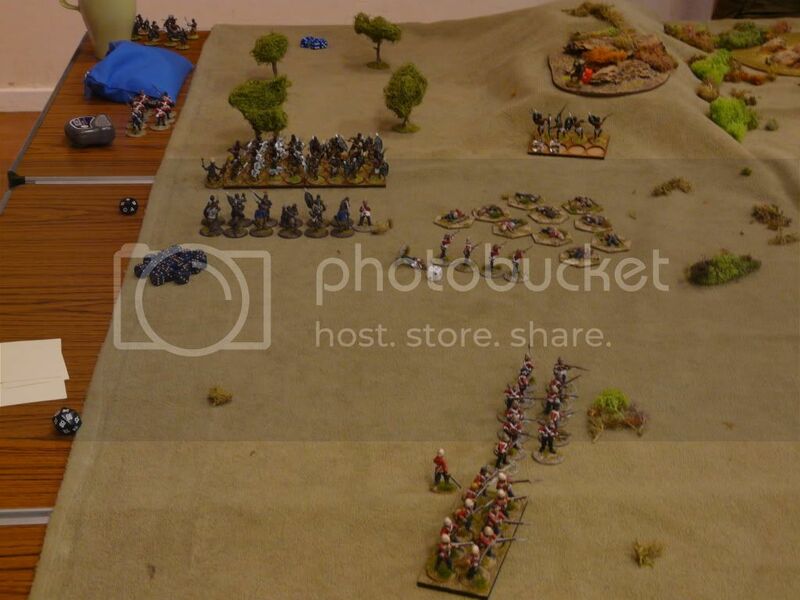 The French on the ridge decided to advance and wheel against the lone British group getting a partial enfilade, the volley tore through them and forced them backwards. The British commander advanced and fired a volley in to the French formation causing casualties and inflicting shock points. 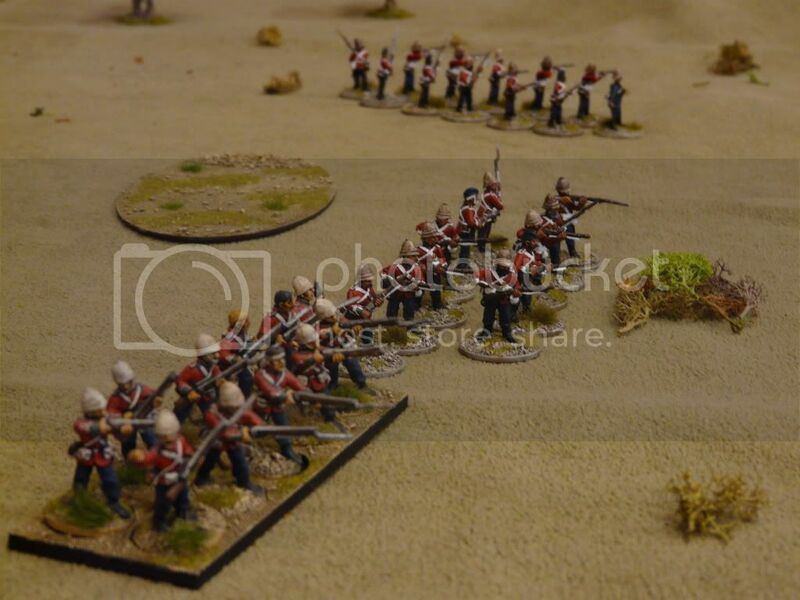 Ordering a charge and using a ‘Grasp the Nettle’ card to add fervour the British charged with the cold steel. In close rounds of fisticuffs the French groups were pushed back and routed. A great game with a reasonable believable result which felt right to us. In retrospect we should have either added another group of French or improved their quality to Good. More games to come once the paint is dry on more miniatures. In preparation for our Big Game in September we played out the first proper game in the Chronicles of Ferguson of the 99th. The plan is to carry over the big men from each scenario for the British which will allow us to add a little flavour to each encounter. So here goes Chapter One. Crossing the Buffalo. Ferguson had been in Natal for less than a week when orders came from up the line. He was to take his platoon and with a detachment of NNC and cross the Buffalo River to provide a covering screen for a company of Engineers who were testing the drift for a suitable crossing place for the wagons of Chelmsford’s invasion force. It was not known how long the mission would last the Engineers would fire a yellow flare once they had completed their scouting mission. 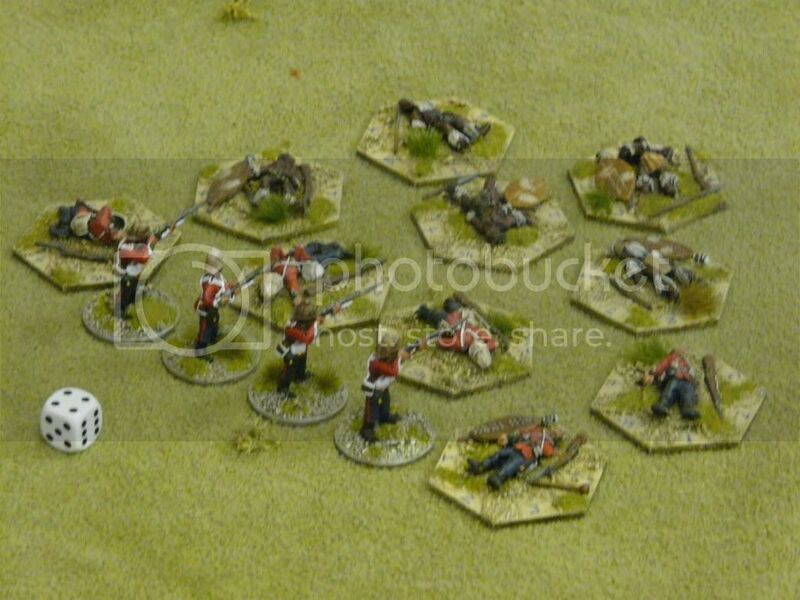 Ferguson being a pragmatic man decided to take his full platoon as he had no knowledge of what lay over the river. Sergeant Taylor his no.2 was his usual self, he had been in country for several weeks and was keen to get a closer look at the mighty Zulu. The British forces advanced on table masked by Blinds, with the NNC securing the left flank and sections 1-3 across the centre of the able. Sergeant Williams of second squad was unwell, as usual he had put his belly before his head and was under the weather after eating some of the local muck. This caused him to miss a couple of turns as he would nip away for a constitutional on more than one occasion – That was to be the least of his worries. On the Right Flank Lt Henshaw was his usual snooty self, strutting about the table barking orders. The morning started well for Ferguson as they march on table Zulu’s were spotted to the right and left of the advancing British however the first concentration of Zulu’s on the bluff turned out to be merely a scouting party. A small group of rifle armed Zulu’s appeared on the left but their occasional rifle fire an no effect on the advancing British. On the left flank a concentration of Zulu’s rushed down the bluff head start for Sergeant Williams Section and Ferguson who had attached himself to the section. A number of Volley’s crashed into the Zulu but they were simply to numerous and they drove into the British Section, first to fall was Williams who was otherwise engaged when the Zulu hit home. The section fought back killing a number of Zulu’s. Ferguson threw himself into the melee in attempt to turn the tide but was over come by Zulu’s with a blow to the head, his efforts were not in vain as the remaining Zulu’s withdrew. Whilst the 99th were engaged to their front a number of Zulu’s burst from the grass land and charged head log into the NNC, they hoped that a full volley would be enough to slow the Zulu their poor fire only served to slow the Zulu advance for a few moments. Faced with odds of 3:1 they at first waiver’d then broke head back across the Buffalo carrying Sergeant Taylor the platoons’ senior NCO with them. Taylor recovered his wits and broke away from the fleeing NNC with intention of saving the remaining men of 1 section who were now leaderless, reinforced by dutch courage borrowed from the quartermaster he ran back towards the now isolated section only to trip and fall knocking himself out for a round….. The survivors of 1 Section were over ran by the main Zulu body. On the right flank Lt Henshaw began to engage the Zulu skirmish line whilst at the same time turned 2 section to fire on the now advancing Zulu’s victors of the melee with the NNC, a number of long range volley’s were enough to force them backwards with the accumulated shock from a number of turns of melee and long range rifle fire. As a yellow flare was seen in the early morning sky, the Zulu’s began to fall back have leaving the field to the British who began task of seeing to their wounded and checking to see if their were any survivors of 1 section. The flanking mission had been a success but at what cost? Medical report to follow shortly. 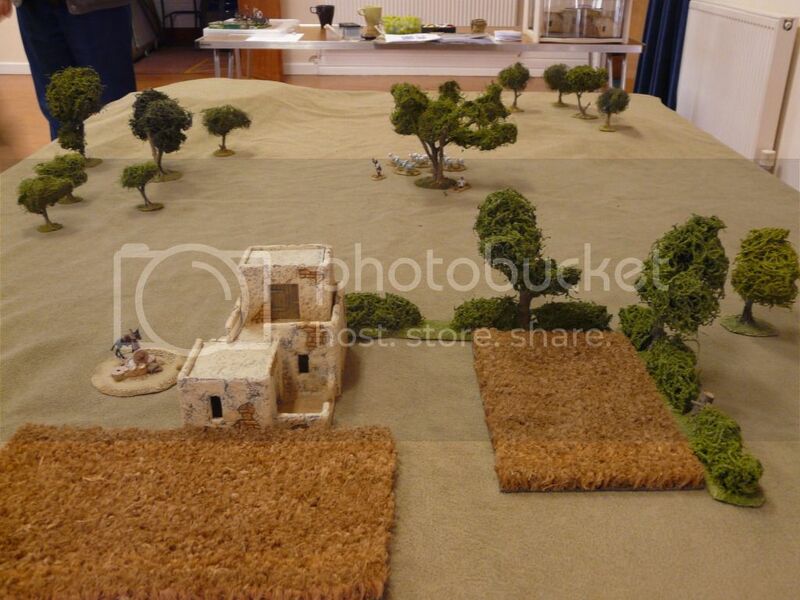 The latest club saw the first outing of our Zulu’s using the ToofatLardies – Sharp Practice rules (TSS). 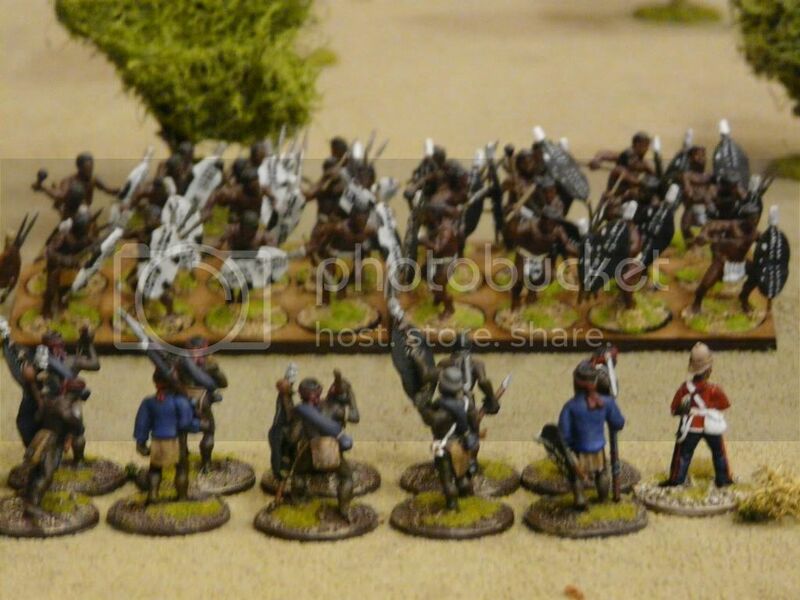 We have tried a couple of different rule sets over the pas 18 months but nothing quite hits the mark for me, we have an all dayer planned for September with multiple commands for the British. 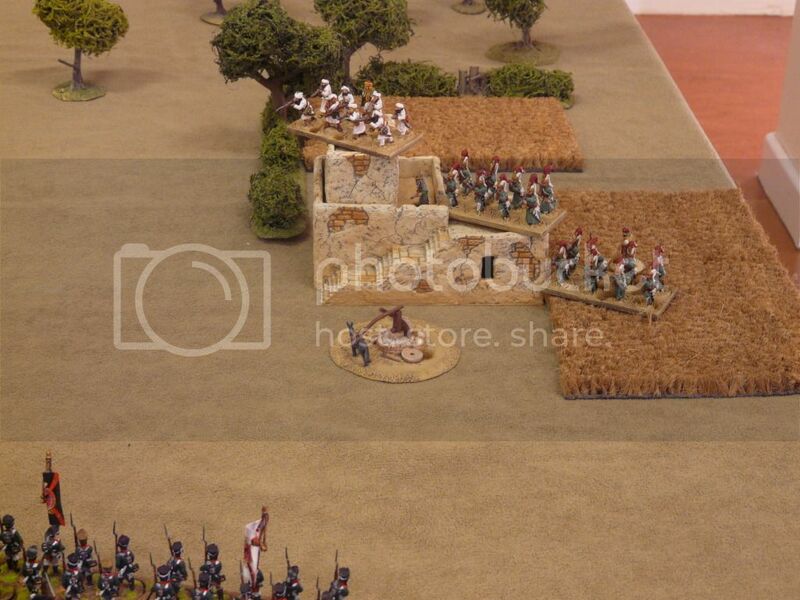 We wanted the Brits to have a bit of character, fighting off the Zulu against significant odds but also with a little room for scenario’s rather than just standing behind a barricade and blazing away. Using a scenario generated from the Platoon Forward supplement. 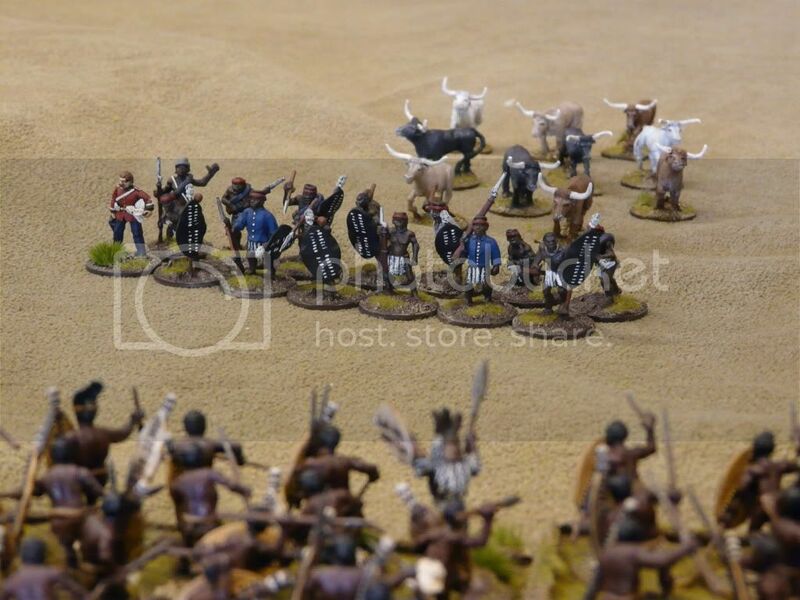 A detachment of NNC and Cavalry have crossed into Zululand and have secured a Zulu cattle herd, however the local Zulu chieftain has sent his warriors to retrieve them, your platoon has been sent forward to support the NNC and Drive back the Zulu. The Colonial command was split into two groups, the cavalry mustered on the hill top whilst the NNC held the valley with the cattle to their rear. 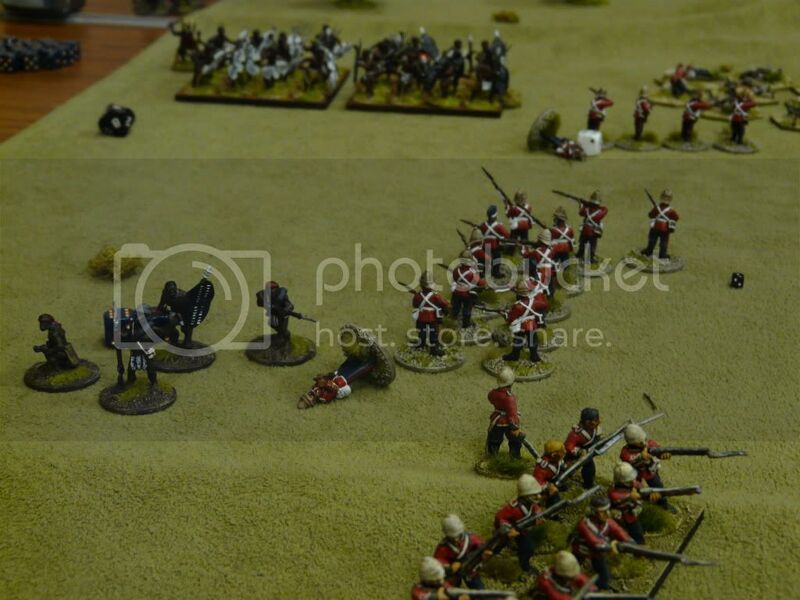 The colonial troops had to hold on until the British regulars appeared on table to save the day. At this stage the first learn of the evening (we are going to need a bigger table…) Dane the Zulu commander had massed his warriors in a classic Zulu formation with Blinds on the left, right and centre of the Colonial command. 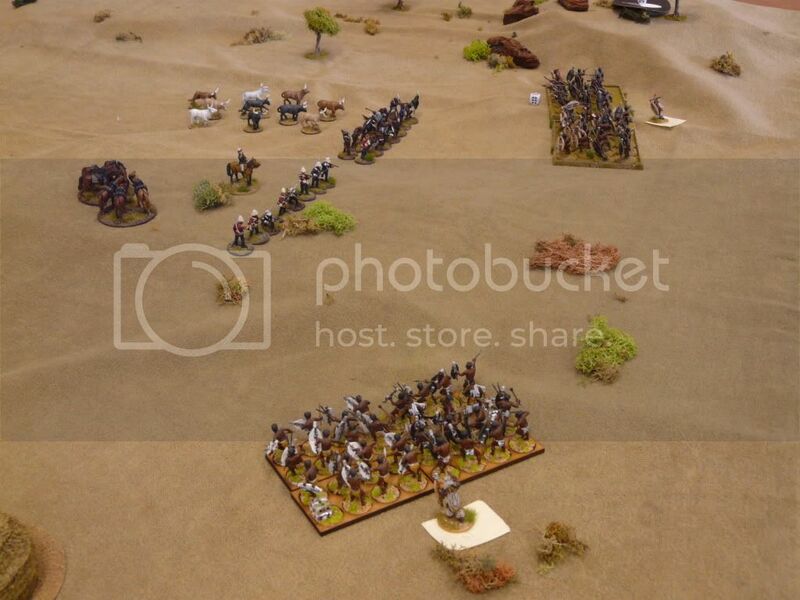 The Zulu to the front were spotted and rifle fire from the dismounted cavalry was able to slow the approaching Zulu so they could not close from their initial charge. In the next bound the Cavalry fared little better, a number of Tiffin cards were drawn which allowed them to inflict some additional casualties on the Zulu but the cavalry number was to few and the Zulu to great. The next Zulu activation saw them wiped out to a man. 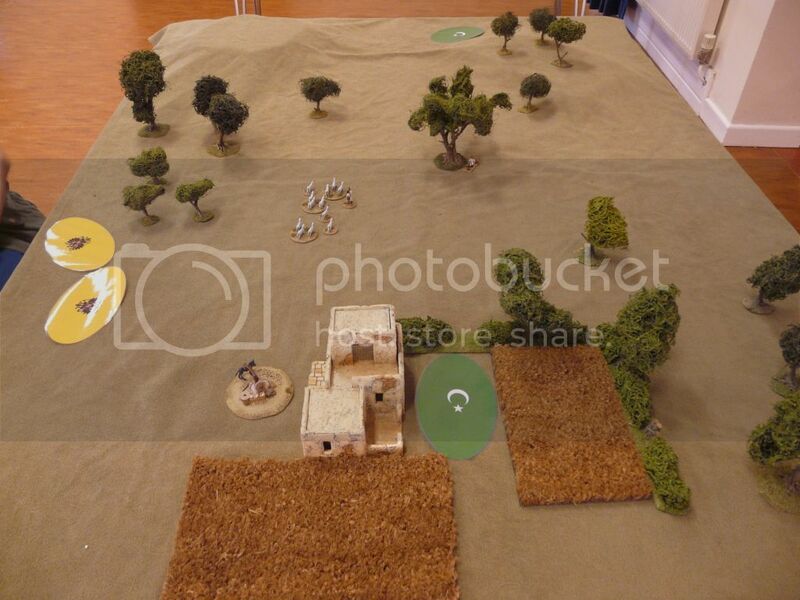 The melee had cost the Zulu a significant amount of shock which slowed their effectiveness and with the British Player finally arriving and firing a number of long range volley’s. The Zulu’s sort cover from behind the hills and rises to recover from the earlier engagement. Another outing next week but the learns so far. 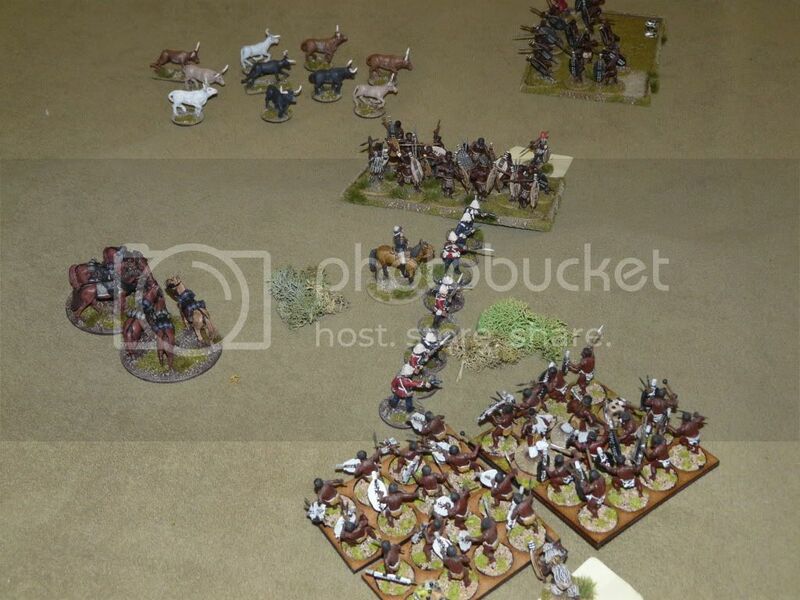 Moving Zulu at the Cavalry trot pace of +3 pips per dice might be a little to much? Increasing the Zulu section to 15 allowed them to keep moving forward. The new colonial cards seemed to work well, but we may need to provide the Zulu player with a handful at the beginning of the game. Allowing the Zulu player to return to blind and splitting into two blinds seemed to create the right atmosphere of not knowing the Zulu’s true strength. We will need to increase the No. of leaders for the Zulu, the kill ration was rather high meaning a leader tended to be shot every time the Brits fired. Using the TSS variant we need to load up the Brits with Experience and Belief to give them a fairer chance in hand to hand, at the same time limiting the number of men fighting should allow the Brits a chance to stay in play for more than one bound. Looking forward to next week and the introduction of character traits to spice up the adventures in Zululand.